Before cable cars graced the streets of San Francisco, horse-drawn carriages were used to transport people and goods up the steep city streets. In 1869, Andrew Smith Hallidie watched a horse-drawn streetcar slide backwards under its heavy load, causing the death of five horses. Witnessing this accident lead Hallidie to build the first cable car in San Francisco. Thanks to compassionate innovators, some industries that once used and abused animals have been replaced with economically viable alternatives that are often even better than their predecessors. For ethical vegans, environmentalists and health conscious folks, it’s easy to see that an end to factory farming is necessary for the sake of animals, the planet, and our own wellbeing. Convincing omnivores, however, tends to be more difficult. So, what is it that will finally help put an end to animal agriculture? While it’s possible that education may motivate some to switch to a vegan diet, it may be creative innovation that is most important for real change. Similar to the story of Hallidie and the cable car, an end to factory farming may be on the horizon thanks to creative innovations. Beyond Meat, is one of these innovations. Beyond Meat not only tastes and feels just like chicken, but also aims to be a market leader in the development of plant protein products and plans to replace animal protein with plant protein where doing so creates nutritional value at a lower cost. Beyond Meat recently hit the shelves of Whole Foods in their prepared food section. If it is capable of doing what it hopes to do, Beyond Meat might mean real competition for the poultry industry. Another innovation is in vitro meat. While it sounds like a story out of a science fiction novel, this may be a game changer for factory farming. In order to create in vitro meat, starting cells are painlessly taken from a live animal and put into a culture where they grow independently from the animal. This process is then used over and over again, eliminating the need for any animals to be used in the process again. For those who may never go vegan, in vitro meat may be the ideal solution. It may take a while until an economically viable in vitro meat option is available, but it certainly may become a reality some day. Another new synthetic meat option is 3-D meat printing, which takes in vitro meat to the next level. Modern Meadow claims that by layering mixtures of cells of different types in a specific structure, in vitro meat production becomes feasible. Essentially, this creates not just muscle but also a structure that would be a hamburger or a steak. 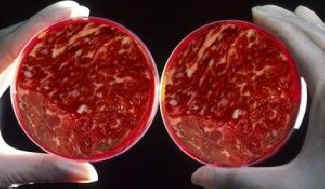 Modern Meadow has set a short-term goal of “printing” a sliver of edible meat. PayPal founder Peter Theil has given a generous grant to the project. While science continues to work on these options, everything possible must be done to curtail factory farming. Billions of animals who are tortured from birth to death need our help right now, as does the planet, so encouraging others to adopt a vegan diet is vitally important. Carnivores, pescatarians, and veg-curious folks should check out delicious vegan recipes from Catskill Animal Sanctuary’s Compassionate Cuisine culinary program, and see how creative and satisfying vegan food can be! If you’re already vegan, try sharing tasty vegan food with your friends and family, and share with them all the compelling benefits of going veg. You’ll be doing a great thing for you, the planet, and so many animals!